NOTE:The cap board does NOT come with Sprague Atoms as shown. It has been noted that the Atoms are no longer the caps they used to be, and are just a repackaged cap in a large can (so that it can be used as an exact retrofit into the old clamp). We have found that newer caps such as the F&T from Germany and the TAD caps outperform the Atoms and are way smaller. 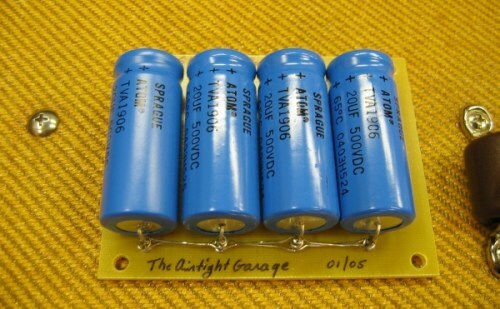 You will get a high quality board with high quality caps, but if you have to have the gigantic blue cans with small caps inside, please call another dealer who will be happy to up-charge you for the Spragues. We feel that the size savings and equal or better performance at a lower price point is a "good thing", and have never had a problem with an F&T or TAD cap. This is a "cap board" for various Hoffman circuits. Please see below for choosing which one you need, and consult the hoffman diagrams on his pages at http://www.el34world.com. All cap boards sold come with mounting standoffs and screws. This board is just the right size to fit under the cap can on the back of a 5F6-A chassis (for instance, the Hoffman chassis), and it has four 20uf caps at 500V. The board comes with one extra cap, so you will receive five caps total. The fifth cap is mounted inside the chassis due to space constraints in the cap can. Note: If you purchase a slightly larger cap can (from Hoffman, TheAirtightGarage, etc) you can fit all five 20uf/500V caps in it on the back of a 5F6-A chassis. Also, in the options list below, the "4 x 20uf + 1" means there are four on the cap board, and one loose to mount inside the chassis. This is for the re-issue cap cans, which are too small for five Atoms. TheAirtightGarage will make any cap board you require, just email or call with your needs (size, number of caps, bus wire connections if needed).